Some big, gusty thunderstorms whipped through Vermont earlier today. I love thunderstorms so this was a nice treat. Swirling dark clouds loomed over Burlington as the storm approached, and when it hit, gusts reached to 55 mph. The first photo in this post really looks like a funnel cloud looming over downtown Burlington during the storm. But it was just a low hanging piece of the storm catching some light. 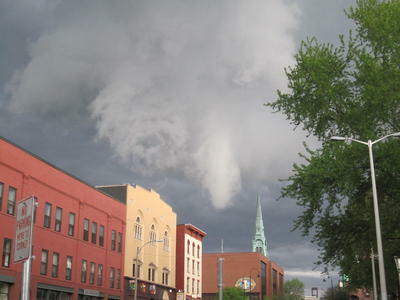 The cloud was swirling, but only slowly, so it wasn’t like a tornado was about to touch down. I felt safe as I took the photo. 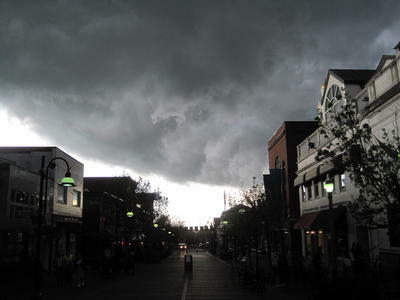 The second photo shows Burlington’s Church Street as the storm swept in. About 15 minutes after I took these pictures, we were back to basking in bright spring sunshine. This entry was posted on May 4, 2010 at 11:53 pm and is filed under Uncategorized. You can follow any responses to this entry through the RSS 2.0 feed. You can leave a response, or trackback from your own site.